This is the second release from the Lone Star label. Volume 2 in the Texas tour series is a soundboard from Dallas, June 6 1975. Sounds familiar? Yes, this is the concert that J. Deary used large portions of to create the concert release on Elvis Aron Presley. However, two songs was deleted back then. First out was T-R-O-U-B-L-E that RCA obviously found a bit to "risky". Secondly, 'Why Me, Lord' that was a bit too funny. They are both here on this CD. 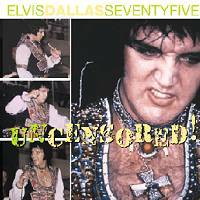 After listening to this CD you might wonder what the **** J. Deary did before the release of Elvis Aron Presley. The sound on this CD is way better than on RCA's album. In fact, the sound on this soundboard is perhaps the best (with the exception of June 10, Memphis) of all June 1975 soundboards so far. As all soundboards from this tour this one is incomplete also. It starts at the end of 'I Got A Woman' and ends after 'American Trilogy'. The last tracks are from Shreveport, June 7 as on the Silverbox release. Also these tracks have better sound. Furthermore, the indroduction is incomplete. Unfortunately the CD itself has an error. Only 'The Wonder Of You' is listed on the sleeve as track 8, but this spesific track also contains 'Burning Love'. 'Burning Love' starts twice, even this an production error...Sloppy! The cover sports some July 1975 photos. We are also promised the Houston concert from June 5, previously announced as released on a CD called Howdy Houston. © Oven Egeland, Elvis In Norway, October 20 2001. What an imaginative title, huh? On the disc, it actually says "The eyes of Texas are upon you". Sloppy, but not the only mistake the Lone Star people made when putting together this product (just keep reading and you'll understand what I'm talking about). The CD is famous for its cover; a picture of a grimacing Elvis with mascara 'round his eyes, wearing a strange collar and that "Iron Cross" flapping against his hairy chest. And the suit! If Jim Morrison was the "Lizard king", during this tour Elvis was the "Gypsy king"! And YES, this is the concert that RCA, by initiative of Joan Deary, edited and released on the Silver Box back in 1980. Sound quality is excellent and playing time is 55 minutes. The show is not complete; it starts just before J. D. Sumner does his Boeing imitation at the end of 'Amen.' After that, it's time for the ol' "creepin' crud"-joke. Later on, Elvis erroneously states, "Here's a song we did about three years ago" before delving into 'The Wonder Of You.' Five years, Elvis. And you guessed it; as usual, he fucks up the intro of the song! You might be surprised to hear 'Burning Love' on this CD as it is not mentioned in the track list. It is in fact squeezed together with 'The Wonder Of You' as track # 8. Now how sloppy is that? This version is GREAT, the highlight of the show and a million times better than the paltry studio version that Elvis cut in '72. Notice the lyric change in 'T-R-O-U-B-L-E'; Elvis sings "I smell Big D-A-L-L-A-S"... A shame that the 'Mystery Train' / 'Tiger Man' medley is played WAY too fast. On a final note, I must say that I can't for the life of me understand why Elvis chose to play 'Little Darlin'' (BTW: the apostrophe is missing in the track list!). Afterwards, he even elaborates on how silly and infantile the song is! Not an outstanding concert, this. But the sound is awesome. On a scale from 1 to 5, I give it a strong 3.